The BioBLU 0.3f and BioBLU 1f Single-Use Vessels allow microbial process development at the highest level. These rigid wall, stirred-tank single-use vessels have been specifically designed for high cell density fermentation with bacteria, fungi and yeast. The BioBLU 0.3f and BioBLU 1f Single-Use Vessels allow microbial process development at the highest level. These rigid wall stirred-tank single-use vessels have been specifically designed for high cell density fermentation with bacteria, fungi and yeast. 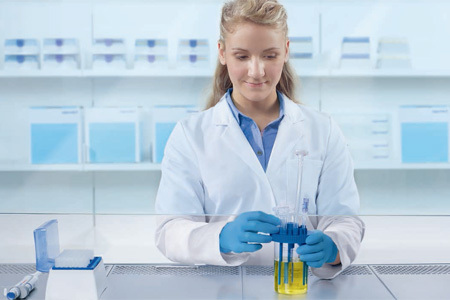 BioBLU f vessels can be used with the Eppendorf DASbox® and DASGIP® Parallel Bioreactor Systems. Parallel bioprocessing stands for simultaneous operation of 4, 8 or more bioreactors, precise control of all critical process parameters and comprehensive information management with the DASware® Software Suite. Process automation achieved through the integration of external analyzers and Design of Experiments (DoE) applications are supported and the implementation of the Quality by Design (QbD) principle is ensured. Benefit from easy handling, minimized set-up time and the elimination of cleaning and sterilization steps to shorten your development times and reduce costs.